The quads have a big role to play in controlling the effects of gravity. When you run further than you have ever run before or run more downhill (where the effects of gravity are greater), you ask more of the quadriceps muscles. As fatigue mounts the muscles become more and more damaged until eventually they have insufficient strength to control your knee bending and you are reduced to a shuffle or walk. While the long run is an essential part of training, you can only increase the long run so much before the risk of injury overrides the training effect. The amount of time needed to recover from a long runs also important to consider. The longer the run, the more days off you need which could be spent doing other useful training. This should be part of all ultra runners training program – whether it is a hilly course or not. 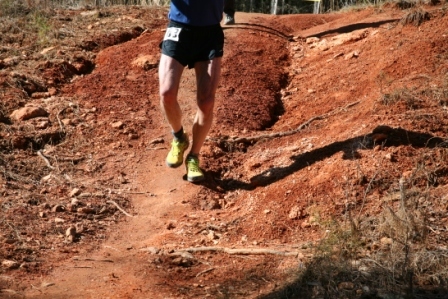 Downhill running involves increased eccentric muscular contractions which your body will get used to. Whilst many runners include hilly runs in their training few include specific downhill sessions. These come with an increased risk of injury but if progressed slowly are an excellent way to prevent blown quads. For more information on how to incorporate downhill training into you routine see here. Very few runners incorporate a well designed strength training program in their routine. I managed to create a running specific routine that put my quads through a far greater load than any hilly 2-3 hour run could ever do. I have written about strength training programs for running here and here. We hope that gives you a sense of how to prep and condition your quads a little better for your next race. But what do you think? Do you have any tips for keep your quads in bullet proof shape?